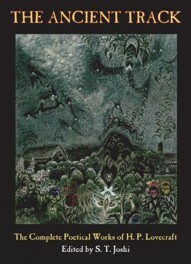 The publication in 2001 of The Ancient Track: The Complete Poetical Works of H. P. Lovecraft was a landmark. For the first time, all of Lovecraft’s 500 or more poems—including hundreds of Christmas greetings, untitled poems, fragments, and poems embedded in his published and unpublished letters—were gathered in accurate texts, with critical commentary and full bibliography. Since that time, a dozen or more poems or poetic fragments have been discovered by scholars and researchers, and this new edition prints these items along with several other works of interest. Poems that Lovecraft revised for various authors are included, along with (where extant) the original poems that served as the basis for the revisions. The original versions of poems by Ovid, Horace, and other classical poets that Lovecraft translated are provided. In addition, the commentary and bibliography have been thoroughly revised and updated. It can well be said that this second edition of The Ancient Track is the definitive collection of Lovecraft’s entire poetic output. It has been edited by S. T. Joshi, a leading authority on Lovecraft and the editor of Lovecraft’s collected fiction, revisions, essays, and letters. H. Lovecraft’s Attempted Journey betwixt Providence & Fall River on the N.Y.N.H. & H.R.R. Epitaph on ye Letterr Rrr. . . . . . .
To W. Paul Cook, Esq. In Memoriam: J. E. T. D.
An Elegy on Phillips Gamwell, Esq. A Prayer for Universal Peace, by Robert L. Selle, D.D. Only a Volunteer, by Sergt. Hayes P. Miller, 17th Aero-Squadran, U.S.A. The Ancient Track: The Complete Poetical Works of H.P. Lovecraft (second revised edition). By H.P. Lovecraft, Edited by S.T. Joshi. New York, NY: Hippocampus Press; 2013; soft cover: ISBN 978-1-61498-070-4.